The Imperious Leader ponders the secret of his origin. You can read most of this story online at the Battlestar Wiki. For some reason the first three pages are missing though; these pages depict the Imperious Leader's body, sitting atop his towering throne, powering down as the narration boxes suggest that a great secret lies hidden beneath the Leader's throne. An abridged version of this story also appeared in Battlestar Galactica: Search for Sanctuary #1. Page 1 refers to the reptilian Leader who began the Cylons' descent into a mechanized race as Sobekkta, the name which was also used earlier in "Nostalgie De La Boue". On page 2, Imperious Leader compares humans to crawlons. In "Into the Void", Boomer refers to the Cylons in their asteroid outpost as a "crawlon in its web." "Crawlon" must be a Colonial term for "spider". In the novelization of that earlier episode, Boomer simply says "spiders". On page 4, we get a glimpse of a Cylon city (perhaps the capital of the empire) at the time the first robotic centurions were being introduced. Page 4 suggests that Sobekkta was known as Czar Sobekkta and page 10 hints the term "Imperious Leader" may have been originated by the dark one as the name for Sobekkta's new robotic body. On page 5, Sobekkta mentions the Vipilian colony which is resisting Cylon attempts at subjugation. This is the first mention of such a species in BSG. Since the scene takes place 1000+ years in the past, they may be either a subjugated or extinct species at the point of the main BSG time frame. The Cylons depicted in this past time period seem to have cybernetic implants on their reptilian bodies already. Also on page 5, Sobekkta seems to suggest that the centurion drone technology is the gift of the "dark one". Most likely this is a reference to Count Iblis. A small image of what appears to be a human in a collared cape is seen in Sobekkta's eyepiece as he says this, again, presumably, Iblis (although on page 9, it seems the dark one is in the form of a reptilian Cylon). Pages 6 and 7 depict the first centurion model and a somewhat later model. 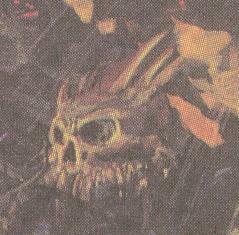 Page 7 shows some kind of alien skull amidst the destruction of one of the Cylons' conquests. On page 8, a Cylon reptilian refers to the dawn sun as "when the sun hatches", suggesting the reptilian children were hatched from eggs rather than having a live birth from the mother's womb (just as Earth reptiles do). 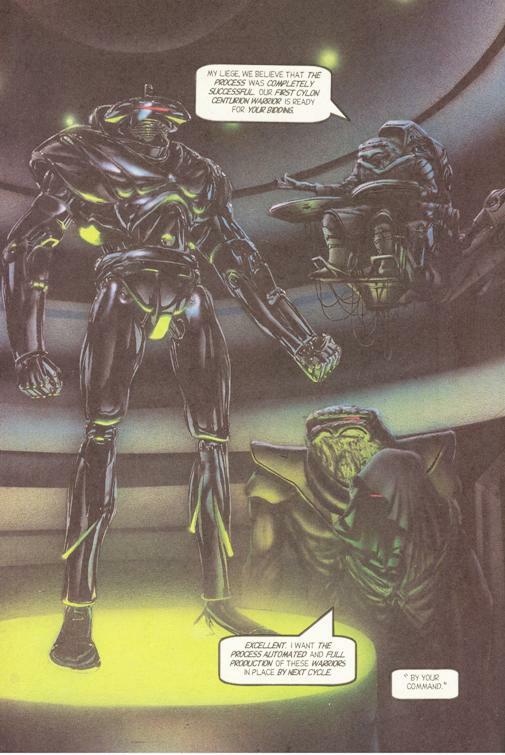 Page 10 reveals that Sobekkta considered his transformation into an almost entirely robotic organism a betrayal by the dark one and he desires revenge against the entity. This seems to suggest that even the Cylons consider Count Iblis an enemy. In the final panel of the story, an image of an exploding battlestar is seen in the Imperious Leader's eye. Presumably, this is the Leader imagining the destruction of the Galactica, symbolic of the end of the human race. This story hints that Sobekkta himself may actually be the final living Cylon, his desiccated body now ensconced within the towering throne of Imperious Leader, pulling the puppet's strings. Possibly this is related to the bizarre transformation the Imperious Leader seemed to be undergoing in "Search for Sanctuary" Part 2? We may never know since this mystery is another one of the unfinished storylines begun by Realm Press before the publisher closed up shop.